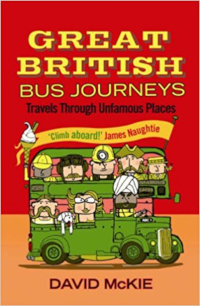 Shortlisted for the Authors’ Club Dolman Best First Travel Book Award, Great British Bus Journeys travels to Britain’s most unfashionable towns (using the least reliable method of transport) and uncovers the nation’s secret history. Through the eyes of David McKie, quiet, unassuming streetscapes are transformed into beguiling and eccentric places of interest. From the Forest of Bowland to Bradwell-on-Sea, McKie’s tour offers a unique survey of our land, rich with history, legend and personality. First published by Atlantic Books in 2006.